DUBAI – Surprise, they never saw it coming. 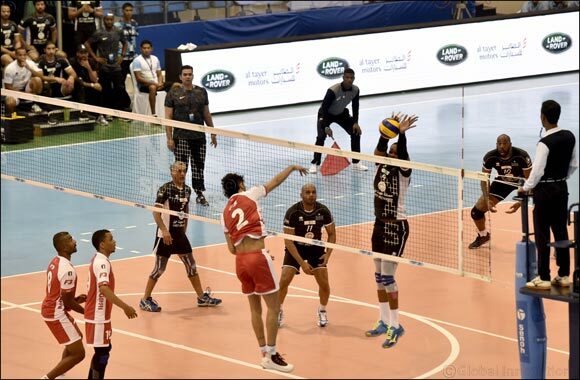 Dubai, UAE, May 19, 2018: The reigning NAS Volleyball champions, boasting two of the world’s top spikers in their ranks and high on confidence, were expected to open their 2018 Nad Al Sheba Sports Tournament campaign with a win against F3 ‘A’. Instead, Surprise were stunned 3-2, despite a fightback from 0-2 down. In the deciding fifth set, the two teams went toe-to-toe until 7-7, but then F3 ‘A’ started inching ahead to eventually prevail 25-20, 25-17, 14-25, 13-25, 15-12 in an engrossing battle that lasted an hour and 55 minutes. In the second volleyball match of the night, F3 scored a 3-0 (29-27, 25-15, 25-23) win over Leader Sport. The two players he was talking about was Surprise’s decorated Cuban duo of Robertlandy Aties and Yoandy Leal, who helped their national team win silver at the 2010 World Championship. Now they are teammates at Brazilian club Sada Cruzeiro, with whom Aties has won a FIVB Club World Championship. Leal has won three Club World Championship titles with Sada Cruzeiro, and a silver and bronze. At last year’s Club World Championship, Leal picked up the ‘Best Outside Spiker’ award, while Aties was voted as the ‘Best Middle Blocker’. Together at Surprise, Leal and Aties did the bulk of the scoring at the Nad Al Sheba Sports Complex on Friday night, with the first scoring 14 points and the latter a game-high 24. Thanks to them, Surprise won the battle of the points 99-92. But they lost the war, due to some astute planning by the F3 ‘A’ coach. The strategy worked for F3 ‘A’ and their Cuban import Yosvany Hernandez, who led the points chart for the winners with 16, is now looking forward to the rest of the campaign. “This is the first match of the tournament and it is always important to start with a win,” said Hernandez. “But this win is even more important because it comes against the reigning champions. So this is a very important for us and you could say, it is worth double the points. The second match got off to a thrilling start with the two teams going neck-to-neck in the opening set until F3 prevailed 29-27. In the second set, F3 steamed ahead from the mid-way mark and then prevailed in the third despite a late fightback from Leader Sport. Xavier Masson defeated Abdulla Ahli and Saeed Al Marri 6-2, 6-2.